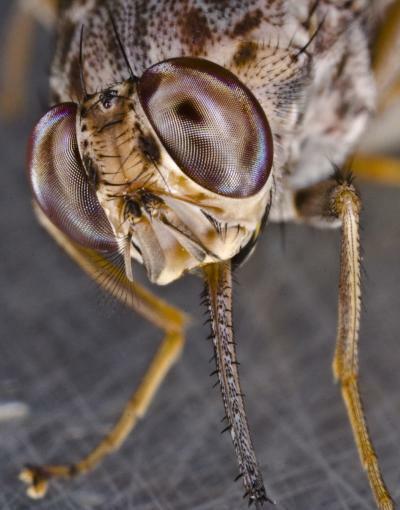 A decade-long effort by members of the International Glossina Genome Initiative (IGGI) has produced the first complete genome sequence of the tsetse fly, Glossina morsitans. The blood-sucking insect is the sole transmitter of sleeping sickness, a potentially deadly disease endemic in sub-Saharan Africa. The vast store of genetic data will help researchers develop new ways to prevent the disease and provide insights into the tsetse fly's unique biology. The tsetse fly is quite unique in the insect world: it feeds exclusively on the blood of humans and animals, gives birth to live young and provides nutrition to its young by lactation. But in the invertebrate world, the tsetse fly is a killer: its bite can transfer the parasite that causes trypanosomiasis, or sleeping sickness. If left untreated, the disease is fatal. No vaccine has yet been developed and current drug treatments have unwanted side effects. An estimated 70 million people throughout sub-Saharan Africa are at risk for trypanosomiasis. And because the disease also affects animals, rearing livestock in endemic areas is difficult to impossible, resulting in several billions of dollars in lost agricultural output each year. Snuffing out the tsetse fly, the disease's one and only vector, has long been a public health priority. The tsetse fly is quite unique in the insect world: it feeds exclusively on the blood of humans and animals, gives birth to live young and provides nutrition to its young by lactation. But in the invertebrate world, it's a killer: its bite can transfer the parasite that causes sleeping sickness. If left untreated, the disease is fatal. The IGGI researchers' goal was to identify the genes in the tsetse fly's genome that code for proteins and then to link those genes to their corresponding biological function, a process called annotation. Proteins are the 'parts list' of an organism and are involved in every aspect of its structure and function. "In a first phase of the project, we used computers to automatically annotate the genetic sequence of the tsetse fly and compare it with the sequences of similar species with known genomes, such as the fruit fly. The computers flagged segments of genetic material in the tsetse fly's genome known to code for proteins in other species and used this data to predict the tsetse fly's gene structure and function," explains Geoffrey Attardo (Yale University), a lead author of the study. Teams of IGGI scientists then manually examined the automated annotations. Doctoral researcher Jelle Caers and Professor Liliane Schoofs (KU Leuven) worked for two years in the IGGI group studying the tsetse fly's neuropeptide signalling genes. "We annotated 39 neuropeptide genes and 43 receptor genes. Neuropeptides regulate most if not all physiological processes including feeding, reproduction, metabolism, water balance and behaviour. In that sense, unravelling the tsetse fly's neuropeptide systems undoubtedly contributes to a better understanding of its overall biology." And neuropeptides may just hold the key to controlling tsetse populations and eventually eradicating trypanosomiasis. "Neuropeptides are promising targets for the development of new environmentally-safe insecticides because they regulate all of the tsetse fly's crucial processes," says Jelle Caers. "Interfering with neuropeptides' proper functioning may allow us to decrease the fly's fitness and thereby shrink populations. There is still more work to be done before trypanosomiasis is eradicated in humans and animals, but decoding the tsetse genome is a big step in the right direction."